This great pier cabinet will be a fantastic addition to your living room or office space. It features three adjustable shelves in the open storage area and one shelf in the bottom cabinet. The piece is constructed out of hardwood solids and wood product with a multi-step white finish including a clear coat finish to help protect against wear and tear stemming from normal use. Combine two of these pier cabinets to the TV stand for a wonderful entertainment center. The Naples Complementary Pier Cabinet by Home Styles at AHFA in the area. Product availability may vary. Contact us for the most current availability on this product. Create a breezy cottage look in your home with the Naples collection. 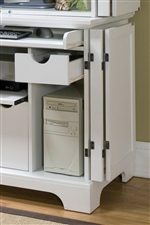 The compact office cabinet and optional hutch makes it easy to write e-mails and work on projects conveniently in your own home. The cabinet comes with a pull-out keyboard tray, which makes it great for your desktop or laptop. Moreover, the entertainment pieces offer plenty of media utility. Made out of hardwood solids and wood products in a multi-step finish, these pieces include a clear coat that protects them from the wear and tear of everyday use. Create the perfect environment with the wonderful pieces in the Naples collection. The Naples collection is a great option if you are looking for Cottage furniture in the area. Browse other items in the Naples collection from AHFA in the area.